This is a “Before” image of an illegally painted gopher tortoise. After its discovery, the gopher tortoise has now been cleaned up by a licensed wildlife rehabilitator and released back into the wild. 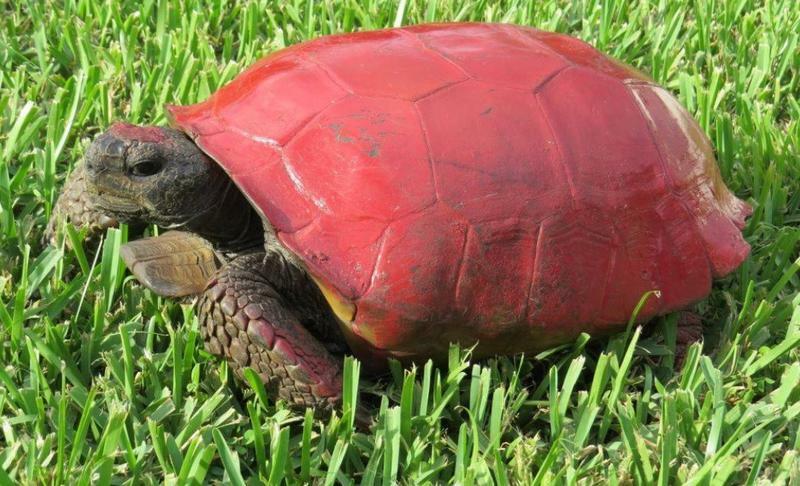 In the last few weeks, two turtles—one painted red and another painted blue—were reported to the Florida Fish and Wildlife Conservation Commission. And, in recent months, FWC officials have gotten similar reports as well. “Some people we’ve seen have put phrases or sayings on the gopher tortoise shell whether it’s with a sharpie marker or some other kind of paint material,” said Deborah Burr, the FWC’s Gopher Tortoise Program Coordinator. Burr says all that is harmful to the turtles and gopher tortoises as their shells are absorbent. Any violators can be reported via the FWC app or the FWC’s Wildlife Alert Hotline at 888-404-FWCC.